This week, as I have been busy, he made us some delicious dishes. This is one of his new favourite, easy and delicious recipe! For those of you who don’t know Japanese curry, the taste is milder than Indian curry. It is usually served alongside white rice. 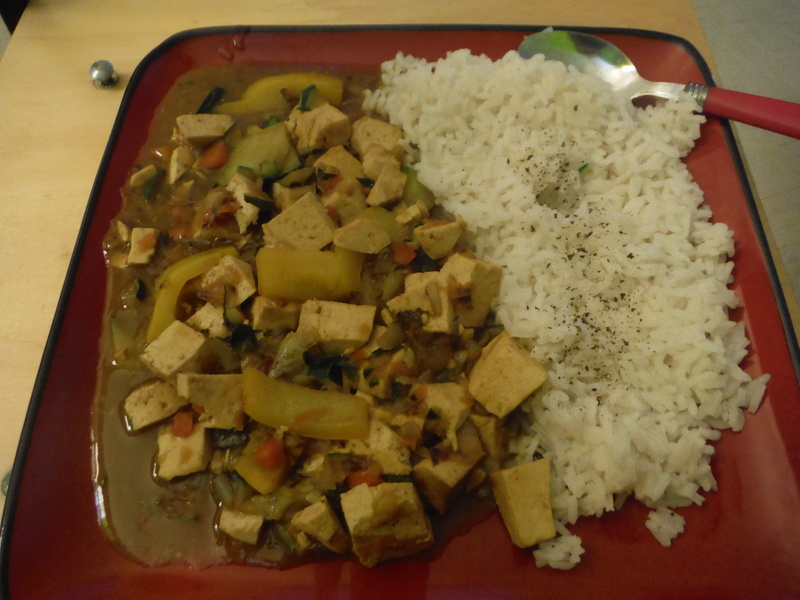 Of course, the original is made with beef, pork or chicken, but tofu is a great vegan alternative. If you know how curry came to be a staple of Japanese cuisine, let us know: we are mystified! Yumyum! We were really hungry! You can usually find already made Japanese curry mix in Asian grocery stores. We used Glico’s mild curry paste. It comes in a small box which contains enough to make three batches of yummy curry! It is not actually a paste but more a block that you can cut in pieces. Anyways, it is pretty cheap and vegan too! – Chop all the vegetables in little pieces. – Cut the tofu into bite sized cubes. – In a large sauce pan, put the olive oil and heat up to medium heat. – When the oil is hot, add the garlic and onions and stir until fragrant. – Add the vegetables and tofu. Stir well and let cook for a few minutes. – When the vegetable are soft, add one cup of lukewarm water. – Add the portion of curry (about one-third of the Glico packet) and stir until dissolved. – Let simmer until the vegetables are well cooked. This is best served with white rice. If your don’t mind gluten, eating this with a fresh warm baguette is my mom’s favourite. The curry flavour is there, but not too spicy. This would be perfect if you want to introduce kids to spices. Let us know if you try this out, or if you have your own recipe for Japanese curry!